We're Hufflepuff, and we play fair. We train darn hard to get up there. We've got the skills, we've got the flair. We'll win this game, fair and square! 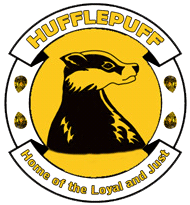 Welcome to the Hufflepuff Quidditch Team (HQT) landing page. From here, you'll eventually be able to find out information about the HQT (lovingly called the Spiffies), the Cheerie-os (the Hufflepuff cheerleading squad), and all sorts of other Quidditch deliciousness. For now, take a few moments to explore the information and resources we have for you. Thanks!